Itzhaky Alma (b. 1984, Israel) Lives and works in Tel Aviv. Graduate of “Hamidrasha” School of Art, Beit Berl. A PhD candidate at the Philosophy Department, Tel Aviv University. 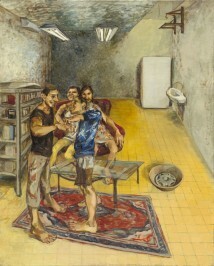 Held solo exhibitions at the Jerusalem Artists House, Tel Aviv Museum of Art and Hezi Cohen gallery, Tel Aviv, and participated in several group exhibitions. Recipient of the 2012 Osnat Mozes Painting Prize for Young Artist and the 2014 Rappaport Prize for Young Artist, Tel Aviv Museum of Art. 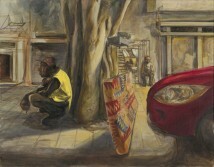 Her paintings reflect the political-social reality state of her generation.